Home » Blog » Felt Alive Needle Felted Dolls » Happy New Year from the Whole Gang! Well, another year down – and what a great year it was! I can’t wait to see what roads my needle felting will take me down in 2008. In my first year needle felting, I have only been able to part with two characters – sob, sob. The remaining cast members decided to all get together for a group shot to wish all you happy needlers out there a very Wonderful and Healthy New Year. After the group shot – they persuaded me to video them – it’s posted on the home page of my website too. 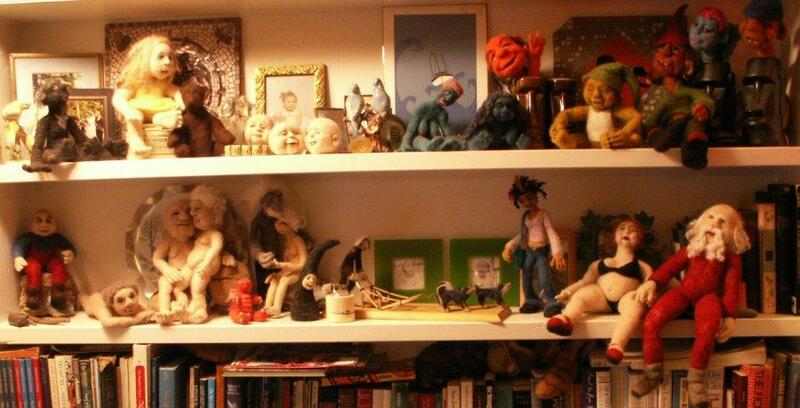 Not only do you get to meet my characters, you get up and close and personal with my knick knacks and family photos they share my shelves with – I’m just glad the camera didn’t pick up the dust!